Hartwell Reservoir rose more than 2 feet above the Drought Level 1 trigger Wednesday at 3 a.m., which prompted a shift to normal operations. This means the flow restriction at Thurmond Dam is now removed. Demand for peak energy is expected to be relatively low in the next few months due to mild weather, which indicates only slight increase in release rates at Thurmond during this time. But there is one brief exception: Thurmond’s current level of 329 feet above mean sea level is not only out of balance with Hartwell, it is also inhibiting gate maintenance. Therefore increase in release rates will be more pronounced initially in order to adjust the reservoir level. Gate maintenance is expected to be complete this spring. The Savannah River Basin entered mild drought conditions Sept. 22 when Thurmond levels dropped four feet below full summer pool. Full summer pool at Thurmond is defined as 330 feet above mean sea level. Thurmond levels descending to Drought Level 1 (DL1) trigger placed a minimum flow restriction from Thurmond Dam, limiting release rates to no more than 4,200 cubic feet per second. This outflow restriction was in place for more than five months until today. According to our water manual, once a flow restriction is induced by drought, that restriction must remain in place until both Hartwell and Thurmond reservoirs rise 2 feet above the respective drought trigger. Thurmond levels rose 2 feet above DL1 trigger Jan. 9, but Hartwell’s levels lagged behind due to minor rain deficits. 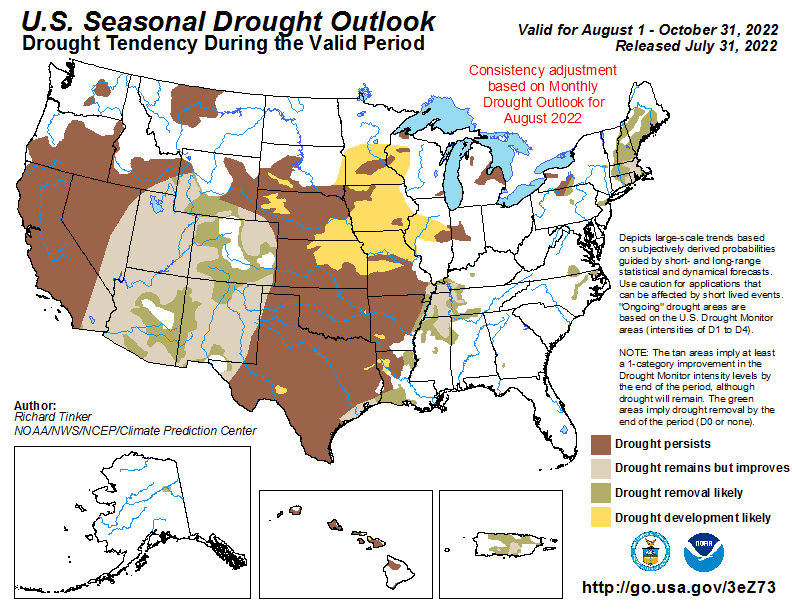 NOAA’s seasonal 90-day drought outlook shows there is no indication of drought expected through the end of May. The most recent ENSO forecast continues to predict neutral conditions with a 50 to 60 percent chance of El Niño (wet conditions) developing in the spring and thereafter. Thurmond precipitation has been more favorable than Hartwell, receiving above-average rainfall in three of the last four months. Hartwell has experienced below average rainfall every month since November. Thanks for reading us, and as always, we welcome your questions and input. This entry was posted in Drought in the News, Drought Response, Rainfall Update, Water Management and tagged drought level 1, full summer pool, Hartwell Reservoir, NOAA, Savannah District, Thurmond Dam, U.S. Army Corps of Engineers, USACE. Bookmark the permalink.